Even though we live in Coronado and our winters aren’t anything to fear, pipes can still burst! When a pipe bursts in your home, it can lead to a myriad of damages, expenses, messes, and headaches. We hope to help you avoid this problem with some of our tips! If you’re wondering what causes pipes to burst and what you can do to prevent it from happening, read on to learn more. Pipes burst because the water entering your home from the outside is much colder than it is normally. When this cold water travels through your pipes, it causes the pipes to contract. This contraction can cause leaks from areas of the pipe that have been weakened over time due to normal wear and tear. What Can I Do About my Pipes? Unfortunately, there is no effective way to heat up the ground surrounding your home and your pipes, so you can’t control the contraction of the pipes. 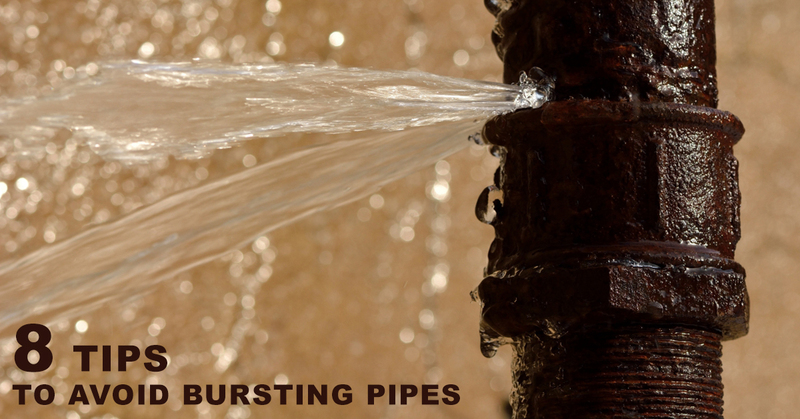 The best way to prevent pipe bursting is by paying attention to your plumbing system and to temperature changes. Follow these helpful tips in order to lessen the chances of your pipes bursting and wreaking havoc on your Coronado home. If it gets particularly cold outside (which we know isn’t often), try to keep one or two of your faucets running slowly at all times. When you have water moving through the system constantly, it becomes harder for anything to freeze within the pipes. Pipes that freeze and subsequently burst are usually located near an outside wall, so do you best to bring in any warm air you can to the colder areas of your home. A great place to start is your basement. If your kitchen sink is on an outside wall, leave your cabinet doors open so that warm air can flow freely in and out. Your kitchen faucet should be one of the ones you leave running at all times, if possible. Disconnect your hose from the faucet outside. When you leave these two connected, then the water will not be able to drain out of the hose bib. This means that it will likely freeze and break. Heat tape can be installed to warm your pipes during the cold days! However, you may want to contact a plumber before attempting to do this by yourself. If you spy any air leaks around electrical wiring, pipes, or dryer vents, use caution and seal these leaks. These allow cold air into your home. You can use caulk or insulation to keep the cold out. Don’t allow the temperature to drop below 32 degrees anywhere in your home, especially where water lines are located. If you suspect that your pipes may not be operating correctly, call a plumber to take a look! It’s better to be safe than sorry in situations such as this. If it’s too late for your home and a pipe has burst, leaving behind standing water, call the professionals at SM Absolute. We are here to help you with water damage restoration. Our team can help bring your home back to the state it was before that pipe burst. Contact us today to learn more!